This article appeared in The Conversation of 26 July 2016, written by Associate Professor of Political Science, Joleen Steyn Kotze. Political heavyweights from South Africa’s governing African National Congress (ANC) and the country’s leading opposition Democratic Alliance (DA) have descended on Nelson Mandela Bay in a bid to woo voters ahead of local government elections. The Nelson Mandela Bay Metropolitan Municipality, set in the Eastern Cape, the heartland of the ANC, is a strategic battleground for both parties. A loss to the main opposition party would suggest that people are losing faith in the ANC as a governing party. A victory for the DA would indicate that it is breaking through a protected core of voters and that it could become a formidable challenger for power in future. The ANC has suffered significant losses in the area due to factional political battles that have had a direct effect on service delivery. Governance has been undermined by maladministration, political interference, and alleged corruption in the Kabuso and Pikoli reports. These events may have a direct effect on the electoral performance of the ANC. For the first time the party faces the real possibility of losing one of its strongholds. Voter support for the ANC is no longer unconditional as communities have become more vocal about its failure to deliver on its promise of “a better life for all”. The ANC’s election campaign rhetoric has focused on the dangers of the past, a return to apartheid if the DA wins, and its continued commitment to advancing human dignity and freedom. The DA has focused on debunking the myth of a return to apartheid, saying that life would be better under rule by the opposition party. Both parties claim their policies and governance strategies will make for a better life for the electorate. Nelson Mandela Bay Municipality, the sixth largest municipality in South Africa, tells the story of both the advancing of a better life, but also of disappointment that a better life has not materialised. Manufacturing, community services, transport and finance industries are the foundation of the metro’s economy. But unemployment among the 1.2 million people who live in the municipality is estimated to stand at 33.2% compared with the 26.7% national unemployment rate. Most households have access to electricity and other basic services. But about 6% of the population, predominantly in informal settlements, still use the bucket system as they don’t have access to proper sanitation. This is despite promises that the problem would be addressed. It is estimated that 35% of all bucket systems nationally are located in Nelson Mandela Bay. The illusion of a better life finds expression in dissatisfaction with poorly built government-supplied houses, the basis of human security. In Khayamnandi, a number of ablution facilities have been built, but no houses have materialised. This is colloquially referred to as “toilet city”. Gang violence has also increased. And, for many, basic education provision remains critical as classes are overcrowded and limited teachers have been appointed to schools. Education is, of course, a vehicle for social mobility. Support for the DA has grown significantly, most notably during the 2011 local government election when it got 40% of the vote. This went up marginally in the 2014 general election from 40.13% to 40.16%. 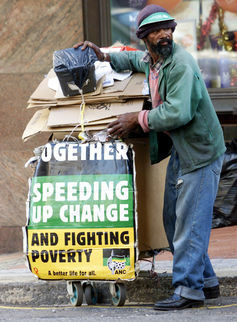 The party is running an aggressive electoral campaign that capitalises on its governance successes in Cape Town, which it controls, and the Western Cape region, where it holds power in a number of local municipalities. To take over the metro council the party would need to make significant gains in ANC strongholds within the metro. But to do this it would need to work on losing the label that it is a “white party”. The DA is in fact one of the most racially diverse parties in South Africa. In contesting the elections, both parties have addressed critical issues like job creation, governance, basic service delivery, gangsterism and delivering on the promise of a better life. The DA has also focused on the delivery failures of the ANC. Here it has capitalised on creating a new political agenda: dealing with key priorities like poverty alleviation, unemployment, and clean and accountable governance, while also emphasising social cohesion, diversity and nation-building. In turn, the ANC has focused on regaining the trust of voters. With the deployment of former South African Football Association President Danny Jordaan as the mayor, the first priority has been to clean up the administration. The party has sought to counter the perception that council posts serve as a road to riches for “tenderperneurs” – reference to businesspeople who enrich themselves, often in underhanded ways, through government tenders. The Jordaan administration has rolled out free Wi-Fi, is attempting to address botched housing delivery and has set out a clear five-year strategic plan. It is difficult to predict the outcome of the election in Nelson Mandela Bay. Recent polls show that the DA is leading the race. But a number of factors could swing the result either way. One of these is how other opposition parties – the United Democratic Movement, the United Front and the Economic Freedom Fighters – perform. We also do not know to what extent the divisive politics of the ANC will resonate with voters, especially in its strongholds. Voter turn-out will also be a crucial factor. Will ANC voters stay away from the polls? Will the DA get its voters out on the day? The uncertainty around the outcome has captured South Africa’s imagination. In previous elections speculation has focused on the size of the ANC’s majority. This time the question on people’s minds is: will the ANC win in Nelson Mandela Bay?